Over the winter I’ve seen a couple of episodes of the TV series entitled “What do artists do all day?”. Each programme featured a particular artist and showed them doing the sorts of things an artist might do. Like, well, painting, for instance. But what about photographers? I’ve spent quite some time this week trying to get my PC to work more smoothly, with some success, I think I dare to say. It certainly wouldn’t make good TV but I spend so much time at the computer, and I imagine the same is now probably true for most photographers. A far cry from the days when you exposed a few rolls of film, put them in an envelope, and waited for the transparencies to come back. Oh, then there’s updating the website, writing the blog, invoicing customers, emailing contacts…..the list is endless. How come I found myself, yesterday, pulling the vacuum cleaner apart and putting it together again, of all things? One of my most crucial pieces of equipment is the camper van. It’s my home from home and enables me to be on location first thing in the morning when so much top quality wildlife and landscape photography is done. And with the passage of time you just have to do a bit of spring cleaning. Banal, I know, but true……. 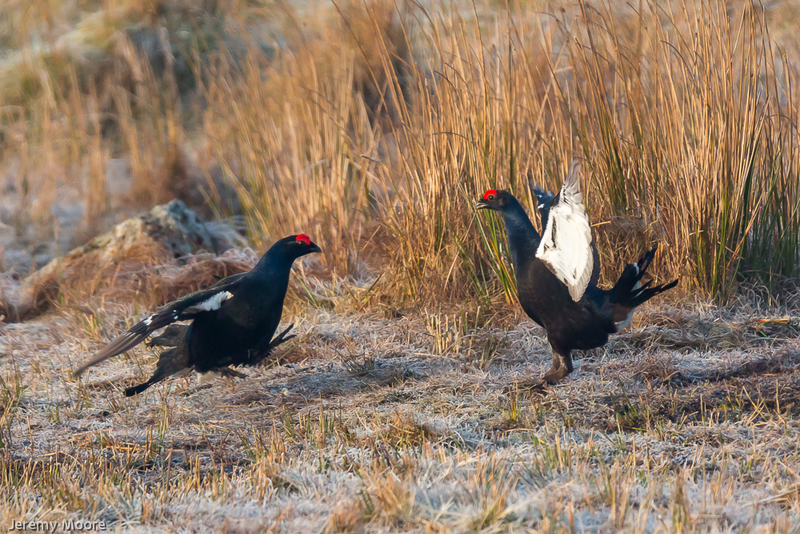 and one thing leads to another……..
To give an example of how indispensable the camper van is, though, a couple of weeks ago I had another go at photographing the black grouse lek which I also wrote about here and here. I drove up the previous evening, parked up nearby and settled down for the night. It was clear and frosty so by sunrise a thick layer of ice had formed on the inside of the windscreen! At 5.15 am I could hear the birds’ bubbling and hissing calls as they began displaying nearby. But it was still more or less dark, and I had plenty of time to make some tea and observe the birds with binoculars while the day gradually dawned. It became apparent that there were more birds present than on any previous visit, and they were taking up stances over a wider area. Having said that the amount of activity was rather variable. Some birds actively jousted with their neighbours, while others looked a bit bored. It was as if they may have been young birds which knew where they needed to be, but didn’t know what to do when they got there. As a whole the birds seemed to be rather nervous and at one point all suddenly swept away. A couple of seconds later a sparrowhawk briefly landed on the deserted lek site. One wonders if the grouse would be less easily distracted at the peak of the breeding season in a couple of weeks time. A little later two greyhens (female black grouse) also flew in, which provoked an extra burst of activity from the lekking males. It was inevitable that on a still morning such as this extraneous noises like the rapid firing of a shutter would be heard by the birds. In anticipation of the “action shot”a shutter burst would begin just as two birds sized each other up. One could imagine how strange, and possibly distracting, this might be from the bird’s point of view. On the other hand it was also noticeable that during a lull in activity a car engine starting (for example) might provoke the birds into briefly displaying more vigorously. This was my seventh visit altogether to the lek site and it was probably the best. Being a weekday there wasn’t too much disturbance as impatient birders and other photographers came and went. Despite bright sunshine the light had a soft quality to it thanks to some atmospheric mistiness, and this was ideal for photographing these high-contrast, black-and-white subjects. The winter yellows and ochres of the vegetation and a layer of hoar-frost made for an attractive landscape in which to set the birds; so much so that I’m planning to include a set of three images from this visit in my forthcoming exhibition. It was also a pleasure and a privelege to be able to watch this fascinating spectacle. So what do photographers do all day? It can really be almost anything from the sublime to the ridiculous. This entry was posted in Uncategorized and tagged bird, birds, black grouse, lek, lekking, photograhy. Bookmark the permalink. 2 Responses to What do photographers do all day? Another excellent read that was, and so was part 1 & 2 too. I must say, I like the idea of photographing from a camper van, even more so while in a sleeping bag, nice one Jerry. Catherine and I have often talked about having a camper but it hasn’t materialised just yet, we’ll keep enjoying the static for now – would be nice to have both though..
Great capture of the Black Grouse btw, I’d swap you one of those for a Dotterel or two! Apologies for the delay in replying; I’ve been away for a week. Thanks for the comments as well, and it was nice to speak to you recently. Maybe we will meet up soon – dotterel permitting!